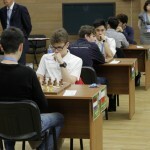 International master Vladimir Barsky prepared a review about the sixth round of the world championship among juniors. 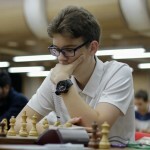 On this day in the tournament among boys there was a change of leaders: Elo-favorite Jan-Krzysztof Duda (Poland) after a slow start came back for the first table and beat Karen Grigoryan from Armenia. 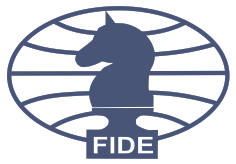 In the opening four knights competitors are already the go to 10th got the original position, and the most difficult – with all the pieces on the Board. It is clear that the time for considering both GM spent a lot. 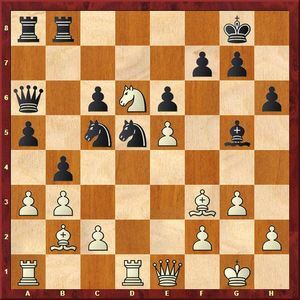 In this position, however, spending 16 minutes of the 22 remaining, beat central pawn – 21.Nxe5!? According to the Polish grandmaster, he saw subsequent combination of Black, but came to the conclusion that it can be allowed. But the alternative is the continuation 21.g4 (like a computer) it is practically not considered. Perhaps this is a rational approach: after 21…Nfd6 22.Nxe5 (22.Ng3!?) 22…Nf7 complications are difficult to calculate, but there are also quite irrational way: 21…Bc7 22.f4!? (well, what man is this good?) 22…exf4 23.Nexf4 Bd7 24.gxf5 Rxf5 – Black has compensation for the piece, since the White King is weak. If you continue in the party risk for Whites is much smaller. It is clear that to beat the pawn cannot: 22.Bxd3? Qxh2+! 23.Kxh2 Rh6+, and checkmate next move. Duda does not cling extra material, is more important for him to seize the initiative. White could not give the quality – 24.Rg1, but after 24…Bc7 25.g3 Nd4 26.Be4 Nf6 retain Black pawn on E2, their figures are quite active. 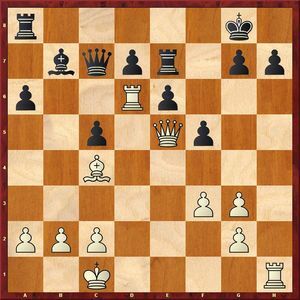 26.Rc1 should be 26…Nd4, and the Bishop still have to pay, because if he is gone, followed by the Shah with d1. And while White is threatening mate in one move. Alternative – 26…Rf6, but actually do not want to take the Rook with the active position. 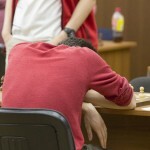 Bishop have to give (27.Rc1 Rxc2), but the Polish grandmaster foresaw it all. Worse 30.Bxd6 Rd2 31.Re1 Nxd6, and Black regains the piece. Formally on the side of Black’s material advantage – Rook and two knights against a Queen. However, the Queen on C7 is very formidable, he alone can defeat the enemy army! Whereas light Black figures no strongholds in the centre, Bishop limited White pawns, the pawn on E2 is soon to be lost. Looks like Duda correctly assessed the effects of combination complications: Black has to fight back. 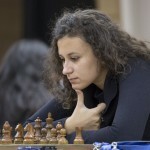 Grigoryan begins to lose the thread of the game. Why voluntarily to exchange active Rook, if you can even “grab” the pawn? After 31…Bd7 (once again defending the knight d6) 32.Kf2 Rxa2 33.Rxe2+ Rxe2+ 34.Kxe2 b6 35.Qxa7 Nc8 Black build a defensive line on the queenside, and it is not so easy to approach. Now Black doesn’t have time to readjust: 33…Bd7 34 should.g4, and they lose the Knight. 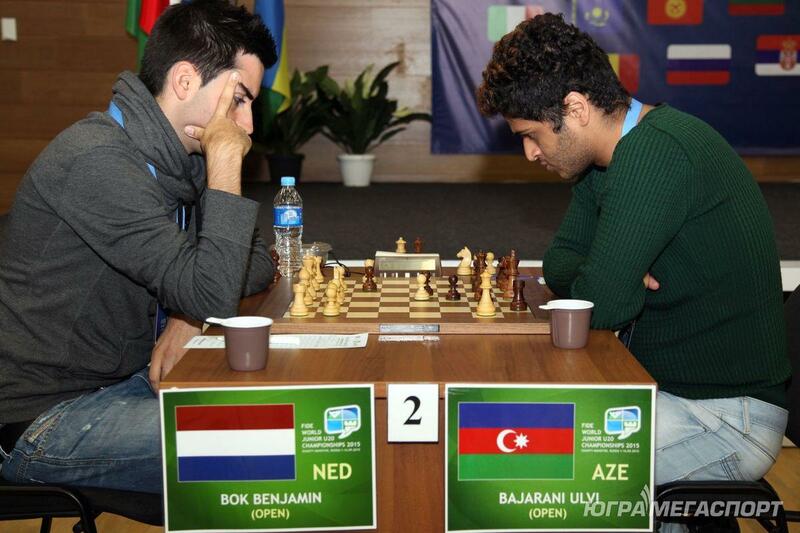 34.Kxe2 Bd7 35.Qxb7 Rxh2 36.Kf2 Rh6 37.Bc5 Nfd6 38.Qb8! 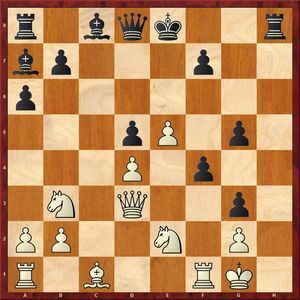 White methodically undermine the opponent’s defense and win a second pawn on the queenside, while protecting the Bishop from the exchange on the Knight. Light the Black figures are very unfortunate, they do not interact with each other. Before the test move Black creates one, the threat of a double blow on e4, but White on the alert. Finally, the gate is in motion. 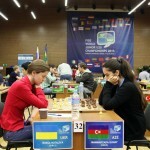 After this victory, Duda came in first place, but no one in the company with the Dutch Junior Jordana van Forrest. Interesting theoretical duel in the system Paulsen: in the debut of the White sacrificed a pawn, and then not to win back – chose instead to withdraw their pieces on the shock position. In the position on the chart they have, apparently, a decisive advantage. As we will soon see, it is important to open the Queen the road to h5. Not helped 20…Rf8 21 due.gxf5 Rxf5 22.Qxf5 Qxd6 23.Qxh7+, and White has the strongest attack in substantive equality. 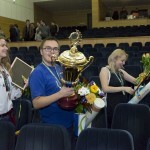 Then perhaps: 23…Kf8 24.Qh8+ Kf7 25.Qh5+ Kg8 26.Qh4! 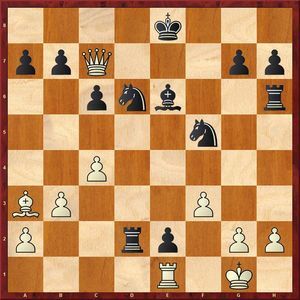 (targeting the Rook on E7, White endanger Rd1) 26…Re8 (no relief 26…Bd5 27.Bd3 e5 28.c4) 27.Qh8+ Kf7 28.Qh5+ Kf8 29.Qg5, etc. After 21…Qxe5 22.Rxe7+ Qd5 23.Bxd5+ Bxd5 24.Rxd7 Black remain without quality. 22…Kh8 23 should.Rxh7+! Kxh7 24.Qh5#; that’s what was needed introductory course combinations 20.g4! But now White gets to the enemy King. 23.Rxh7 Rd7 24.Rh8+ Ke7 25.Qxg7+ Kxe6 26.Qxg4+ Ke7 27.Qg5+ Kf7 28.Rh7+ Ke6 29.Rh6+Black resigned. 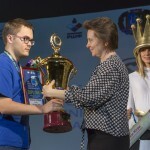 Vice-champion of Russia among juniors with apparent ease outplayed his opponent. 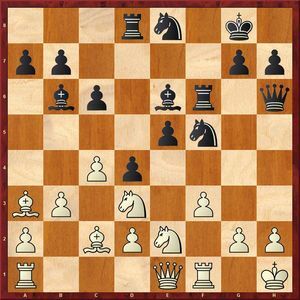 The Black figures were skoczylas on the queenside, Knight C5 deprived of support – all these factors White is able to use. On the retreat of the Knight 23…Nd7 24 should.Be2!, and gets in trouble Black Queen. Ligament decides the outcome of the fight. 27…Rxa1 28.Rxa1 Bxd6 29.exd6 Qxd6 30.Be5 Black resigned. 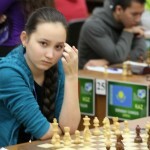 Continues winning streak Zhansaya Abdumalik from Kazakhstan – she already has 6 points out of 6! In the sixth round as the day before her party ended around 20 moves after the blunder of the opponent. 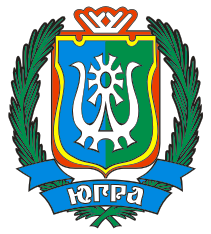 Ukrainian chess player played a very interesting debut, sacrificed a piece for two pawns, compensation received serious threats on Black line “h” is very dangerous. After normal developmental progress 21…Be6 the struggle had only just begun; most likely, White would have had to put the piece back on g3 or f4. However, upper part, probably, counted that can win immediately. Now in the case 22.Nxf4 Qh4 23.Nh3 gxh3 22.Bxf4 Rh1+! 23.Kxh1 Qh4+ Black, indeed, win. However, after 22.Rxf4 they had to give up: in the version of 22…Rh1+ 23.Kxh1 Qh4+ 24.Kg1 Qh2+ 25.Kf1 Qh1+ 26.Ng1 There is no checkmate. 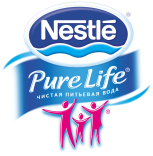 Fascinating was the bout of the two Russian girls. 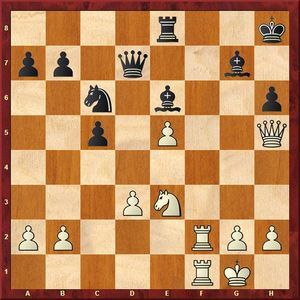 In the opening White gave the Bishop for two pawns: the victim was very interesting, but hardly correct. But then Bivol outplayed her opponent and created dangerous threats on the Kingside. Is the case when they usually say: “Chess is not checkers, not necessary to beat!” After 28…Nd4 29.Nc4 attacking White, but Black can fight back. In the case of 29…Bg8 30.Rxh6+ Bh7 White wins quite effectively: 31.e6! Rxe6 32.Qf5! Probably, it’s a beautiful Knight connection to the attack were losing sight of Drogovoz counting to 30.Rxh6+ Rh7 or 30.Qxh6+ Rh7 31.Rf8+ Bg8 32.Qf6+ Qg7. In fairness, we note that in the second embodiment, after 33.Ng4! Qxf6 34.Nxf6 Rg7 35.Re8! Black is also a difficult position: cant ‘t be untied, and White just push his pawns. Or 30…Bxf5 31.Qxh6+ Rh7 32.Rf8#. 31.Rf8+ Bg8 32.Qg6 Rg7 33.Qxh6+ Rh7 34.Qf6+ Rg7 35.e6 Black resigned.